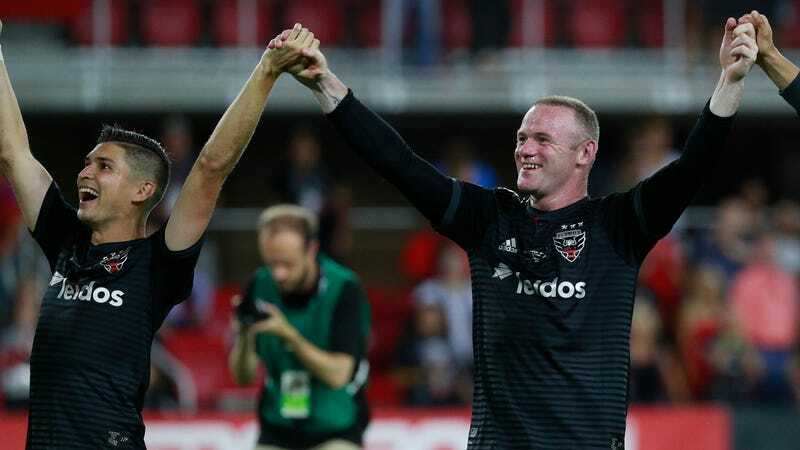 Three months after sitting at the bottom of the MLS’s Eastern Conference playoff race, D.C. United have secured a playoff spot, thanks to the efforts of Old Man Wayne Rooney. He scored two goals in today’s 3-1 victory against NYCFC to make the postseason berth official. When the former Premier League champion announced his intentions to join D.C. United in MLS, the move was derided and mocked as a sign that the Englishman was officially washed. The criticism wasn’t exactly without justification. Rooney had just finished up a disappointing return to his boyhood club, Everton, and was arriving to a team that was dead last in the conference playoff standings. Rooney had an immediate impact as he assisted in his first appearance for D.C. United and recorded 12 goals and six assists in 19 appearances, with some beautifully absurd highlights along the way. Before Rooney, the club had one lone win in 13 games; now, they’ve won 14 and are in the playoffs. The Old Man is still quite strong.